Inbound marketing can be very time consuming work when it relies heavily on lead generation, email marketing, and lead management. As we discussed in our last post on social media marketing automation, that not all the work should be automated. It’s still important to focus on managing a marketing strategy manually as it is to utilize online tools that will help cut your time in half. Hubspot is considered a pioneer in automated digital marketing and as an inbound marketing software company, they have helped numerous businesses transform their marketing. Hubspot proves that marketing automation goes beyond email and helps you integrate everything on one platform. For more on Hubspot’s marketing automation, go to Hubspot.com. 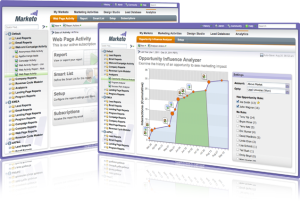 Another great marketing software, Marketo offers a cloud-based software platform for sales professionals to sustain customer relationships. Marketo offers solutions for every marketing need including email marketing, lead management, consumer marketing, customer base marketing, and mobile marketing. Pardot, by Salesforce, has features that help sales and marketing professionals build their own marketing campaigns. They offer everything from generating leads, creating emails, and calculating ROI with CRM integration that helps marketing and sales teams work together seamlessly. Drip promises that their software is easy to use and integrates your blog or website with email. The software allows you to collect your email list, create campaigns, send email blasts, overall automate triggers to subscribers. A B2B cross-channel marketing software like Oracle Eloqua, allows marketers to plan and execute automated marketing campaigns for their customers and prospects. Like other marketing software solutions, Oracle connects cross-channel, content, and social marketing. Modern marketers and leading brands use oracle Eloqua because it’s a trusted proven system. Are you already using any of these online tools? Do they help your overall inbound marketing strategy? Let us know in the comments below! Want to learn more ways to enhance your inbound marketing strategy? Take the free website analysis to see how your website can be improved!